To communicate with the brain, the team will first insert a gene into neurons that makes fluorescent proteins, which flash when a cell fires an action potential. This will be accompanied by a second gene that makes a light-activated “optogenetic” protein, which stimulates neurons in response to a pulse of light. 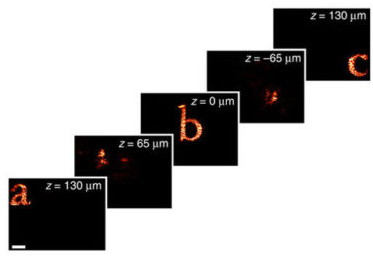 This microscope is based on the revolutionary “light field camera,” which captures light through an array of lenses and reconstructs images computationally in any focus. The combined read-write function will eventually be used to directly encode perceptions into the human cortex — inputting a visual scene to enable a blind person to see. The goal is to eventually enable physicians to monitor and activate thousands to millions of individual human neurons using light. 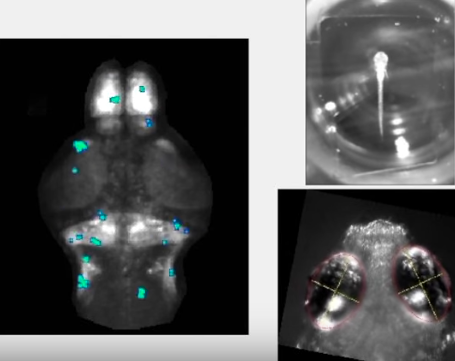 Isacoff, who specializes in using optogenetics to study the brain’s architecture, can already successfully read from thousands of neurons in the brain of a larval zebrafish, using a large microscope that peers through the transparent skin of an immobilized fish, and simultaneously write to a similar number. The team will also develop computational methods that identify the brain activity patterns associated with different sensory experiences, hoping to learn the rules well enough to generate “synthetic percepts” — meaning visual images representing things being touched — by a person with a missing hand, for example. The brain team includes ten UC Berkeley faculty and researchers from Lawrence Berkeley National Laboratory, Argonne National Laboratory, and the University of Paris, Descartes. * In future articles, KurzweilAI will cover the other research projects announced by DARPA’s Neural Engineering System Design program, which is part of the U.S. NIH Brain Initiative. ** Light penetrates only the first few hundred microns of the surface of the brain’s cortex, which is the outer wrapping of the brain responsible for high-order mental functions, such as thinking and memory but also interpreting input from our senses. This thin outer layer nevertheless contains cell layers that represent visual and touch sensations. Team member Jack Gallant, a UC Berkeley professor of psychology, has shown that its possible to interpret what someone is seeing solely from measured neural activity in the visual cortex. *** Developed by another collaborator, Valentina Emiliani at the University of Paris, Descartes, the light-field microscope and spatial light modulator will be shrunk to fit inside a cube one centimeter, or two-fifths of an inch, on a side to allow for being carried comfortably on the skull. During the next four years, team members will miniaturize the microscope, taking advantage of compressed light field microscopy developed by Ren Ng to take images with a flat sheet of lenses that allows focusing at all depths through a material. Several years ago, Ng, now a UC Berkeley assistant professor of electrical engineering and computer sciences, invented the light field camera.